So in our whole soap about how to get RAID1 on our OS disks in a S2D setup, we actually found an answer. 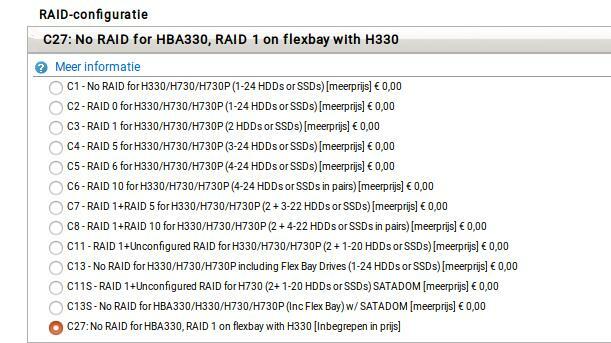 The solution was to use a HBA330 for S2D setup and a seperate H330 RAID controller for the OS in the flexbays. This was confirmed by Dell. My concern was this wasn’t configurable if you ordered a Dell server, but this has been fixed. Personally, I would recommend you wait until the R740xd s2drn documents are available (this was supposed to be halfway September, but I think they are about due) and configure R740xd for your setup, preferable with 24 NVMe’s ;-). So even though it’s nice to have things fixed, it looks a like a little too late to me. By the way, it seems not possible to use the flexbays with RAID1 for a R740xd setup, you are supposed to use the BOSS cards. I don’t like that option, I prefer to hotswap a OS disk instead of opening a server, so I have asked questions about this at my contact at Dell. Do you have the Dell part number for the H330? I’m assuming this is a PCI-E card? I’ve ran into the exact same issue as you and I haven’t been able to figure out Dells website. Maybe they changed something? It says it fits the R730. Be sure to let your Dell sales guy confirm that part fits your Dell server (specify with the servicetag for your specific configuration). It hasn’t been the first time I got into an argument with Dell ppl who said a part should fit while it didn’t. If you have confirmation in the email, it’s much easier to start that discussion.